Approximate distribution of Semitic languages around the 1st century, ignoring surviving speakers of Punic in the Western Mediterranean. 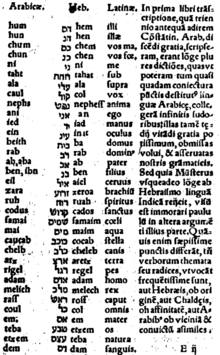 There is evidence of a rule of assimilation of /j/ to the following coronal consonant in pre-tonic position,[clarification needed] shared by Hebrew, Phoenician and Aramaic. 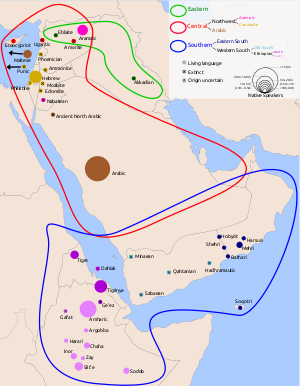 There are six fairly uncontroversial nodes within the Semitic languages: East Semitic, Northwest Semitic, North Arabian, Old South Arabian (also known as Sayhadic), Modern South Arabian, and Ethiopian Semitic. These are generally grouped further, but there is ongoing debate as to which belong together. The classification based on shared innovations given below, established by Robert Hetzron in 1976 and with later emendations by John Huehnergard and Rodgers as summarized in Hetzron 1997, is the most widely accepted today. In particular, several Semiticists still argue for the traditional (partially nonlinguistic) view of Arabic as part of South Semitic, and a few (e.g. Alexander Militarev or the German-Egyptian professor Arafa Hussein Mustafa) see the South Arabian languages[clarification needed] as a third branch of Semitic alongside East and West Semitic, rather than as a subgroup of South Semitic. Roger Blench notes that the Gurage languages are highly divergent and wonders whether they might not be a primary branch, reflecting an origin of Afroasiatic in or near Ethiopia. At a lower level, there is still no general agreement on where to draw the line between "languages" and "dialects" – an issue particularly relevant in Arabic, Aramaic, and Gurage – and the strong mutual influences between Arabic dialects render a genetic subclassification of them particularly difficult. ^ a b Kogan, Leonid (2012). "Proto-Semitic Phonology and Phonetics". In Weninger, Stefan. The Semitic Languages: An International Handbook. Walter de Gruyter. pp. 54–151. ISBN 978-3-11-025158-6. ^ Watson, Janet (2002). The Phonology and Morphology of Arabic (PDF). New York: Oxford University Press. p. 13. Archived from the original (PDF) on 2016-03-01. ^ "Old Aramaic (c. 850 to c. 612 BCE)". 2008-09-12. Retrieved 2011-08-22. ^ "LIN325: Introduction to Semitic Languages. Common Consonant Changes" (PDF). Archived from the original (PDF) on 2006-08-21. Retrieved 2006-06-25. 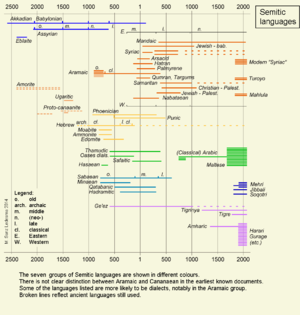 ^ Kaufman, Stephen (1997), "Aramaic", in Hetzron, Robert, The Semitic Languages, Routledge, pp. 117–119 . ^ "Old Aramaic (c. 850 to c. 612 BC)". 2008-09-12. Retrieved 2011-08-22. ^ "Aramaean – Britannica Online Encyclopedia". Britannica.com. Retrieved 2013-01-27. ^ "Akhlame – Britannica Online Encyclopedia". Britannica.com. Retrieved 2013-01-27. ^ "Mesopotamian religion – Britannica Online Encyclopedia". Britannica.com. Retrieved 2013-01-27. 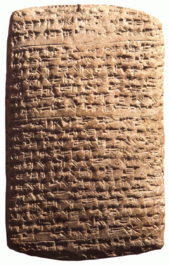 ^ "Akkadian language – Britannica Online Encyclopedia". Britannica.com. Retrieved 2013-01-27.